old and new urbanism in the Bull City, from a libertarian progressive. 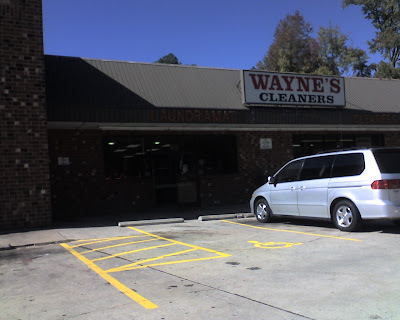 I don't go to Wayne's because I love the little warren of shops south of NCCU, the prices are great, the service is good, or it's close to my commuting route (although all of these things are true). I go there because the "Laundramat" sign makes me chuckle everytime I stop in. Won't see that in Cary. I wish you wouldn't go to Wayne's. They don't do the best job with blouses. Why? Because the most pressing issue facing Durham is how to manage growth while keeping its, ahem, gritty character. "I know why you are conservatives -- you favor private enterprise for the poor and socialism for the rich."